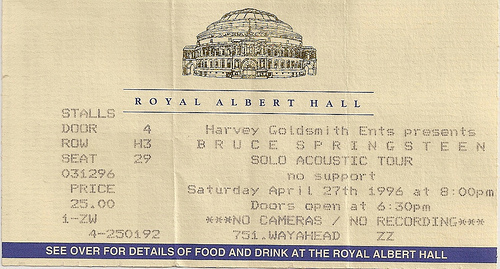 Bruce rearranged this song and released it as track 14 on his 1992 album Human Touch.He covered the song 3 times live. Twice during World Tour 1992-1993 and once during The Ghost Of Tom Joad Tour. PONY BOY is a modified version of the traditional song MY PONY BOY. Springsteen is credited for arrangement and additional lyrics. The song also features Patti Scialfa on harmony vocals. The song was originally recorded for the upcoming charity various artists album For Our Children,but Springsteen replaced it at the last minute with a cover of Nancy Cassidy's Chicken lips and lizard hips and instead released Pony Boy on Human Touch. According to Brucebase, another version, without Patti Scialfa on harmony vocals, was also recorded but does not circulate. On 16 Jul 2005 in Albany, NY, Springsteen sang a snippet of Pony Boy during the spoken introducing to Long time comin' . "My Pony Boy" is a popular song written in 1909 by Bobby Heath (lyrics) and Charley O'Donnell. It was incorporated into the Broadway musical Miss Innocence (1909) where it was introduced by Lillian Lorraine. The old expression "giddy up", exhorting a horse to gallop at high speed, is a corruption of "get ye up". The term "tony" refers to someone of high "tone" or social elegance.